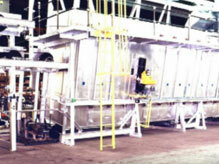 Pin Ovens are used in the beverage container industry ( Metal Decorating ). Aluminum and or steel cans are base coated and decorated on the outside with the identifying product logo. (Coke, Pepsi, Budweiser, etc.) Typically the cans are decorated (printed) on high speed, multi-color printers. From the printer the cans are transferred to a “Pin Chain” to carry the can through the dry/cure and cool oven system. Pin chain is roller chain with a pin attachment on the side usually 6 or 7 inches long. The pin has a “pin tip” that is suited for the can it is to carry. This unique chain provides the transporting of the can by inserting the pin into the can and not having any outside surface be touched in the process. This pin chain travels at over 800 feet per minute. Beverage cans come in a variety of sizes. Some are very tall and narrow and some are short and wide, and all combinations in between. The Pin oven must be designeed to handle the variety of shapes as well as the variations of decorating used on the can. Pin ovens are built on a slight angle to help keep the cans on the pins as they travel a serpentine path through the oven and cooler. The high speed and tight turns required to meet high production has been the driving force in the design of the pin oven. Stability of the can is imperative to prevent damage to the decorating or the can itself. A very precisely engineered air delivery system is used to apply heated process air to the can. The air must be sufficient enough to reach the entire surface of the can and uniform enough to maintain the stability of the can. Pin ovens are “zoned” to provide the proper time temperature profile needed for the intricate decorative coatings used. Exhaust fan volumes and locations of pick up points are consistent with maintaining the delicate balance of the oven chambers and the stability of the cans. After the cans complete the dry/cure cool cycle, they must be removed from the pins. The FECO “Pin Stripper” is mounted to the end of the pin oven where it “strips” the can from the pin chain and transfers the can to a flat conveyor.